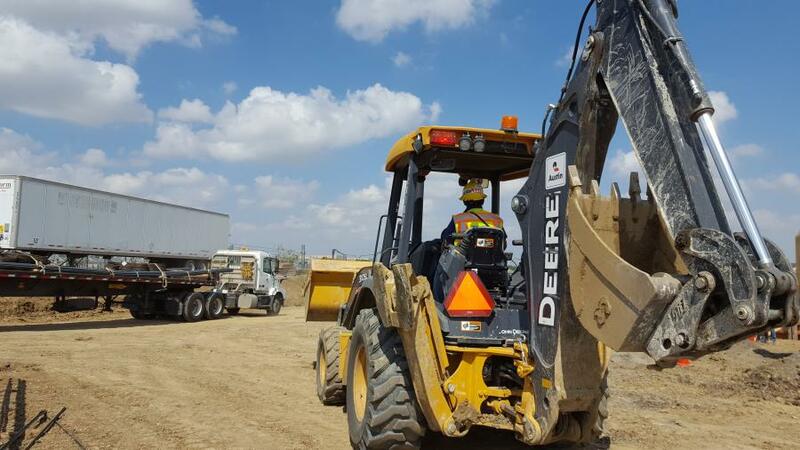 As the first phase of a $1 billion mixed-use project being constructed by telecom heavyweight Verizon and Dallas developer KDC, Pioneer Natural Resources is making plans to relocate to its new headquarters in Irving, Texas. Approximately 1,100 employees of the independent energy company will move to the more than $100 million 10-story office building in 2019. With its lease set to expire in 2020, Pioneer was in need of new office space. The city of Irving has reportedly agreed to provide almost $6 million in economic incentives for the company's move to the more than 500,000 sq.-ft. building in the Hidden Ridge development in Las Colinas. The relocation follows a year of planning and negotiations. Pioneer's current headquarters are in the Williams Square office complex in Las Colinas' Urban Center. In addition to providing sufficient work space, the firm's new campus will include a large cafeteria for company employees, along with a fitness center and day care center. Work officially started on the project in summer, 2017, and continues at a steady pace. 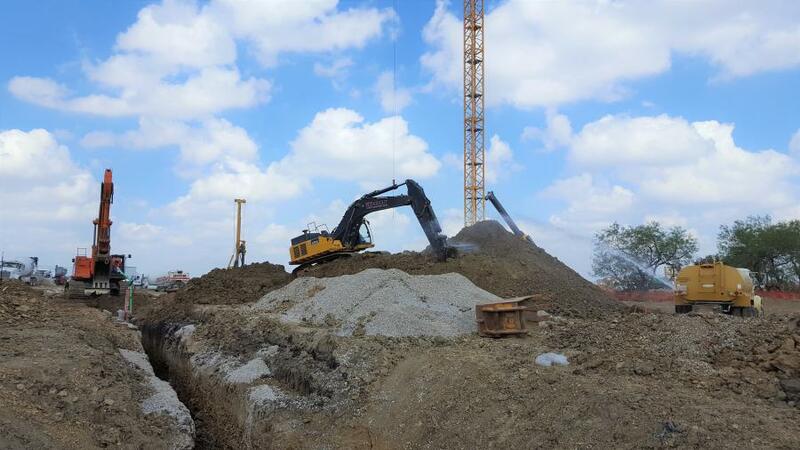 “Currently, we are completing the mass excavation and backfill of the site, installing underground utilities, plumbing and electrical and pouring foundations,” said Goodman. 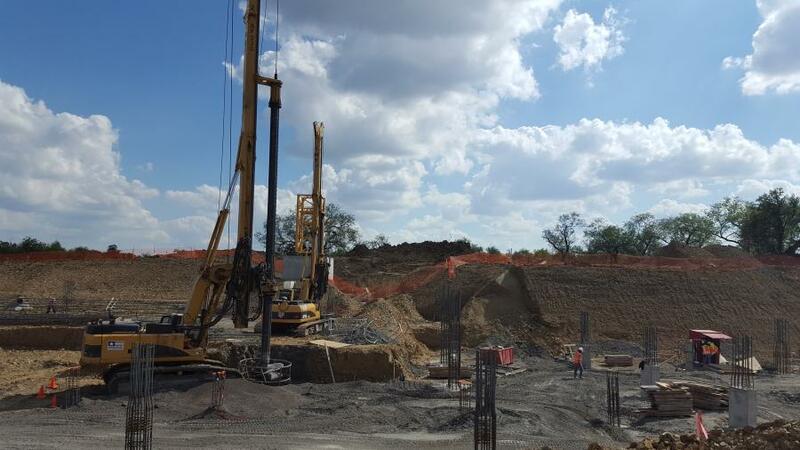 “The building pads have been constructed, and we are close to complete with the drilled piers at the buildings. Goodman said constructing a multi-level office building that includes a glass curtainwall and stone façade is no small task. Because the seven-story parking garage will be built using precast concrete, actual construction is limited for that portion of the project. “We just build the foundation and get out of the way. The precast concrete is shipped to the site on flatbed trucks and then assembled like puzzle pieces. After the precast is erected, we will pour some concrete, install the elevators, hang the lights and paint the parking stripes. Of course, there is more to it than that, but the precast concrete structure eliminates many of the steps,” said Goodman. The job location, however, is another story. Goodman said outdoor conditions have not been an issue, so far, but crews are prepared to adapt, if necessary. Other than the foundation and basement from an old ranch house, the site was fairly natural. 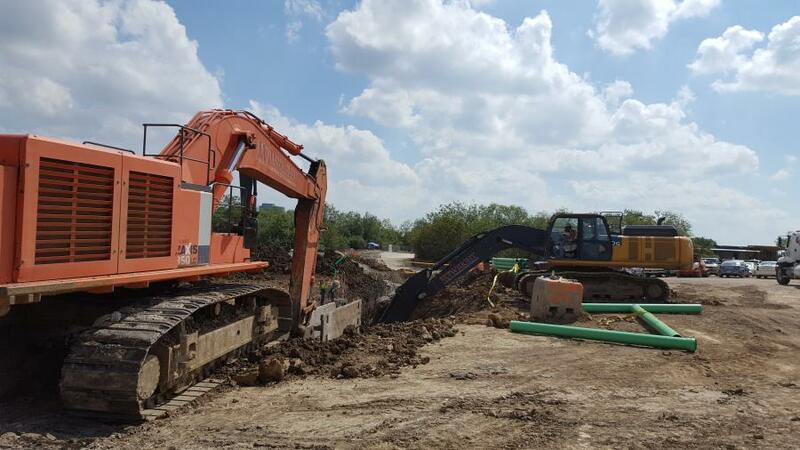 As for excavation work, said Goodman, “The soil in Las Colinas is well known for its movement, so the project is designed to accommodate it. The buildings are being built with crawl spaces to get the slabs up and away from the soil, so not much prep work is required for the existing soil in a crawl space. 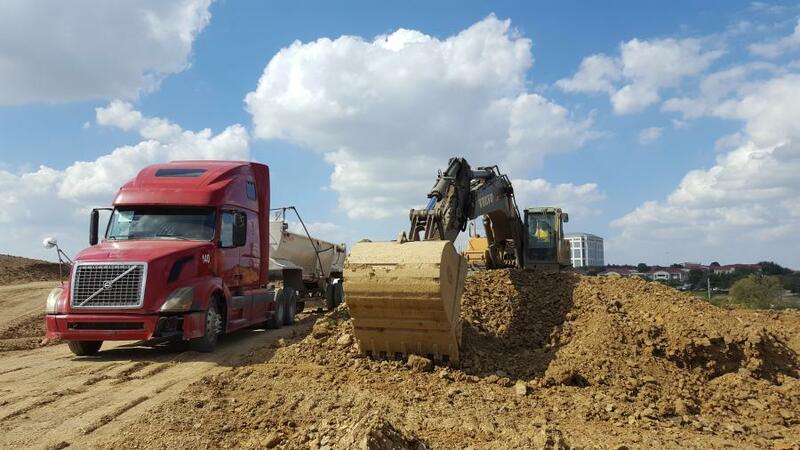 For slabs on grade and the primary drive lanes, the team selected moisture conditioning of the existing soil as the solution to reduce the movement. Crews are hauling off approximately 60,000 cu. yds. of material as part of their efforts. 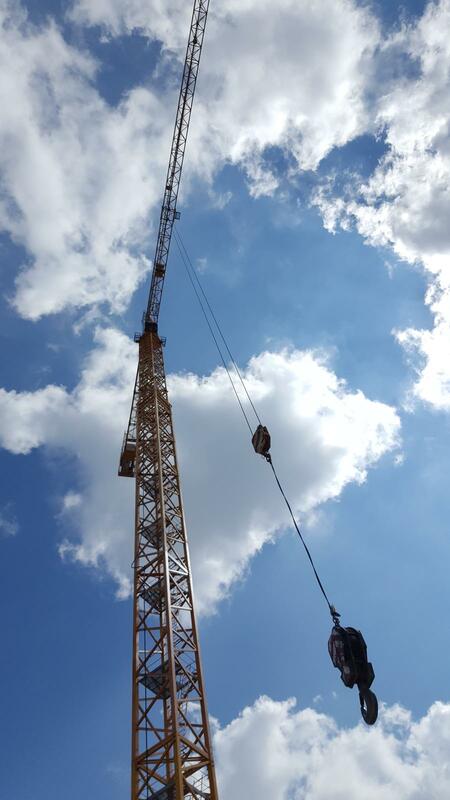 Equipment being used to carry out the various project tasks include bulldozers, loaders, track hoes, haul and dump trucks, backhoes, skid steers, telescoping forklifts, rubber tire cranes, tower cranes, conventional cranes, concrete pumps, compressors, light plants, boom lifts and scissor lifts. Water trucks also will be utilized, along with generators, pumps, welding machines and swing stages. Materials required to complete the work include concrete, reinforcing steel, post tension, masonry, stone, structural and miscellaneous steel, roofing, waterproofing and sealants, metal panels and curtainwall. Other supplies include wood doors, drywall and acoustical, paint, tile, trees and plants, pavers and railings. Goodman noted that the most time-consuming part of the work also is the most important. Members of the design team are equally proud of their contributions to the new headquarters. The creative team found inspiration in a crucial aspect of the work and mission of employees, which is the exploration of the earth's layers. According to Duda|Paine founding principal Jeff Paine, “The challenge of bringing all the organization's employees onto one site is one we've tackled successfully before. It's a tremendous opportunity for a client to use architecture to solidify and clarify their organization's identity and culture. The floor of each of the building's two wings is approximately 43,000 sq. ft., with the central hub at 17,000 sq. ft. The style is contemporary, with extensive glass and aluminum curtainwall that infuses light into interior spaces with aluminum shading devises on all facades. The Hidden Ridge Development is 150 acres, and will include a two-acre greenspace with amenities on the area's historic Carpenter Ranch. The Pioneer site includes a tree-lined lake. The design calls for the addition of another lake, which will connect the existing body of water through a spillover rock bed. “A bridge across the lake will allow employees and visitors alike to experience the water as they drive into the Pioneer site,” said Beachler. “The design preserves an existing mesquite grove. The building's placement at a high point in the topography will allow sweeping views. Jogging trails for the employees will be carefully inserted throughout the site so they can experience the natural beauty and gain a sense of ownership of the environment. Sustainability also played a key role in the design process, with the project pursing LEED Silver certification. Paine added that working on the new headquarters is extremely gratifying, and a welcome opportunity for his firm. The Pioneer building will be one of the largest parts of the development west of State Highway 114. It's being built on Verizon-owned land that's across the street from the telecom firm's regional office campus. 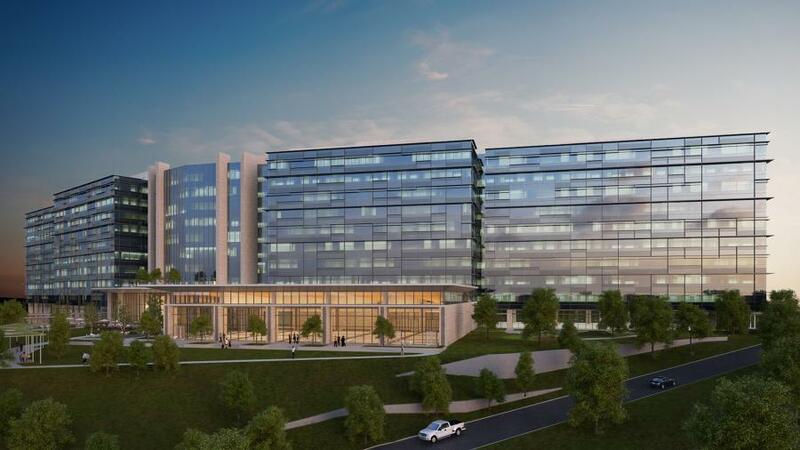 The Hidden Ridge project will include retail and restaurants, apartments, hotel and additional office space, as well as a new DART light rail station that will connect the mixed-use project with Dallas/Fort Worth International Airport and downtown Dallas.